Playing Her Story with my other half gave us a thirst for more detective stuff, so, like junkies reduced to shooting baking soda between our toes, we found ourselves solving a murder (or is it!) with Inspector Jenks in Contradiction. Let’s be absolutely clear about this: The acting in Contradiction is some of the worst performed in any medium. Jenks—he’s the guy in the fedora, of course he is—never uses one facial expression when five could equally suffice. In fact his eyebrows appear to be acting in a different medium altogether, seemingly a 19th century French farce, and the rest of the cast are little better—managing to chew up both the scenery and the .avi files on which its contained. And yet, despite the whole thing coming on like an explosion at the amateur dramatics society, we found ourselves having fun. 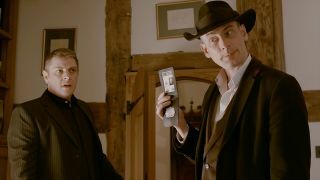 The plot, which takes in brainwashing, the occult, and the production of homebrew real ale, is sub-Midsomer Murders stuff (Americans, imagine Murder She Wrote, only even weaker sauce), but ploughing through the clues and witness statements looking for the contradictions that push the story on proved diverting enough for a couple of nights. It’s not in the same league as Her Story of course. There’s nothing here that will make you think differently about the medium. But I’m increasingly convinced there’s a police procedural genre to be had here. It's been a good week for companies announcing their upcoming announcements. Both Mafia 3 and Endless Space 2 are getting full Gamescom reveals next week, as is a new World of Warcraft expansion. The Germany-based convention has always been a good show for PC gaming—more so than E3—and this year is clearly no exception. I'm particularly excited to see what Amplitude are cooking up, as Endless Legend was one of my favourite 4X games of recent years. I guess that means my high for the week is that next week is going to be really good? We posted my Hitman piece this week, in which I spoke to IO Interactive about how they’re recapturing the spirit of old Hitman; you know, the Blood Money-esque stealth sandbox experience you liked before Absolution came along. Seeing it in action was one of my E3 highlights, just because the environment they showed off—a Parisian palace that’s both a fashion show and a secret auction of political secrets—looked exactly like how a modern version of a Hitman environment should. While the Early Access-style release model for Hitman is sort of confusing, I’m looking forward to seeing what IO has been working on for three years when Hitman arrives in December. Rising Thunder, the fighting game I previewed last week, is now in technical alpha—invites are going out in waves to people who register on the official site. Now that it’s populated with players, it pretty much stays open in the background whenever I’m on my PC. There are plenty of issues, like that it tends to timeout in between games, but free alphas are gonna do free alpha stuff like that. I can forgive it, for now, because it offers me the opportunity to get into a new fighting game without the pain of getting into a new fighting game. Since there are no fun or good games available anywhere, my friend Mat and I decided to binge on whatever free-to-play game had the brightest colors and biggest letters in the Steam store. We witnessed some true horrors, but stumbled into one of the most profound gaming experiences I’ve had in recent memory: theHunter, an online, open world, big game hunting sim gave us a father. With no intent to actually play the game as designed, we instead settled on asking if anyone in the global chat would be our honorary dad. I’ll never forget Acebomber21’s words of wisdom that day. He imparted genuine advice, like to stop shooting at the sky or to quit running and whistling everywhere we went. In time, Mat and I observed our impromptu pa stalk and bag a buck whitetail. He asked us to stand next to it so he could take a picture using the game’s first-person digital camera. Was it pride? Acebomber21 eventually left us. We didn’t listen. We decided to chase the boar and whistle it to death. Dad left the game. However fleeting, our connection was beautiful, and pretty messed up. But that’s what video games are all about. I attended my first QuakeCon in Dallas, Texas this past weekend. It's a really neat convention with lots to do and see, from the Bring Your Own Computer room, featuring the biggest LAN in North America, to the tabletop gaming room, to the presentations of Fallout 4 and Doom. We were all given a cool surprise as well: hands-on with Doom multiplayer. There was a single map, playable in 6v6 team deathmatch sessions for 6 minutes at a time, two sessions going at once, and the winners got to play each other on the main stage. Doom multiplayer has a real Unreal Tournament vibe to it: fast-paced combat, cool guns, and a well-designed map with great flow that made me feel like I was always moving forward even though I was essentially running in circles. The speed didn't quite match multiplayer of old—I found myself automatically pressing Shift every so often in an attempt to run faster—but it was still a fun and frantic experience. Best news for me personally: the plasma rifle, which I thought looked a little underwhelming in the gameplay footage, felt and sounded great. The only downside: no chainsaw in that particular version of multiplayer. To which I say: what the hell?